The story’s middle. It runs about 50 to 60 pages. It’s all about the protagonist’s struggle to overcome obstacles between him/herself and his/her goal that was set up in Act One. Act Two also introduces the subplots and their lesser important dramatic questions which hopefully, in some way, tie into the story’s major through-line. The Wizard of Oz: Will the Tin Man get his heart? Will the Scarecrow get his brain? Will the Cowardly Lion find his courage? As each attempt to overcome the obstacle(s) fails, and as more and more obstacles get introduced, things look bleaker and bleaker for the protagonist. Often not only does the protagonist fail, but also in doing so, causes the predicament to become even more severe. For every one step forward (a success) there are two steps back (failures), the stakes get higher and higher increasing dramatic tension. Dorothy and her new friends encounter dangers along the Yellow Brick Road. The Wicked Witch harasses them. The scarecrow is set on fire. The tin man rusts up. 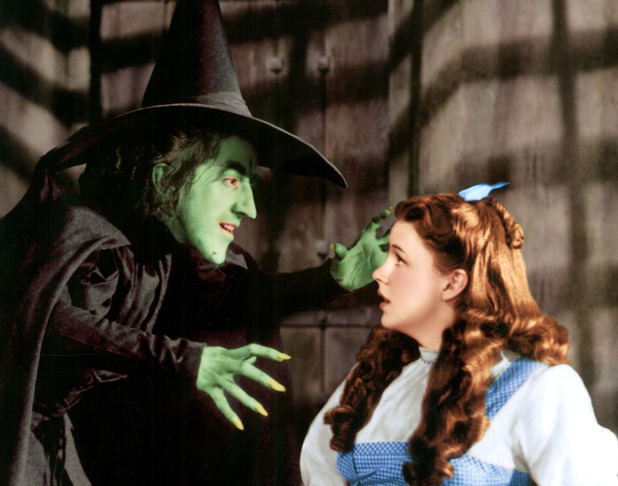 Dorothy loses hope when the witch threatens – “Surrender Dorothy.” They finally get to Oz and the Wizard won’t grant them an audience, all they’re hopes dashed. And sometimes a fumbled effort or new hard-won knowledge causes the main story’s central dramatic question to change – a plot twist. Dorothy and friends are finally granted an audience with the Wiz, but he won’t help them unless they first get rid of the Wicked Witch of the West once and for all. And now we have a whole new set of obstacles to overcome. Flying evil monkeys. Kidnapping. Imprisonment. Sleep-inducing poppy fields. Toto’s impending demise. The protagonist meets his/her darkest hour – it appears that all is lost. Dorothy can’t escape her prison. Her friends fail at rescuing her. Dorothy’s going to meet her maker at the hands of the Wicked Witch when the sand runs out of the hourglass. A failed escape ends in a face-off and there’s no way out. There is seemingly no hope that Dorothy will live, let alone get back home…but then there’s Act Three.